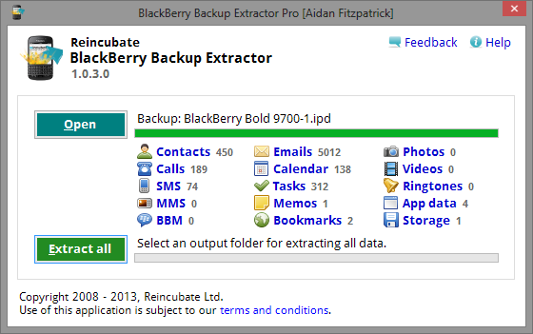 The Blackberry Backup Extractor allows users to recover data such as email, contacts, SMS messages, notes or calendar events from Blackberry IPD backup files that have been made using Blackberry Desktop Manager. The software runs on Windows, OS X and Linux and does not require Desktop Manager to be installed. If you need more information please contact the developers of BlackBerry Backup Extractor (Reincubate), or check out their product website.